I took a walk outside yesterday. On that stroll I took a deep breath, and sighed because summer is sadly over. However, I’m certainly not concerned about catching a cold because of the cooler weather. In fact, I haven’t been sick in years. What’s my secret? It is definitely one of the best classic homemade healing foods I have ever eaten! It is also a very popular comfort food. I’m talking about chicken soup. Not canned and processed soup, though. I make the real stuff, just like grandma used to make. It’s a food that seems to cure any illness, but have you ever wondered why? Better Digestion: Bone broth soup can help heal the gastrointestinal lining, and treat digestive conditions, such as leaky gut syndrome. The bones contain plenty of the powerful amino acid glycine. I recall a study from the American Journal of Physiology. The study found that glycine stimulated hydrochloric secretion within the stomach in healthy volunteers. The researchers also observed other infusions during the experiment, such as saline, and related glycine peptides, like diglycine, triglycine, and tetraglycine. The glycine and its related peptide infusions would increase plasma glycine concentrations. Stronger Immunity: Do you have the flu or a cold? Bone broth, and chicken soup in particular, is known to strengthen the immune system. An in vitro study published in the journal Chest suggests that there may be certain substances within a traditional chicken soup that contain medicinal properties. The study observed that the soup would inhibit neutrophil migration during a standard chemotaxis chamber assay with chemoattractants. Simply put, it boosts your immune system. Bone and Joint Support: Why not support bones with bones? Bone broth is rich in minerals such as phosphorus and calcium, which are important for bone health. Gelatin and collagen are known to improve joint pain, especially in osteoarthritis patients. A clinical trial published in the International Journal of Medical Science supports my point. The 90-day study compared the safety and effectiveness between undenatured type II collagen and the combination of chondroitin and glucosamine in osteoarthritis treatment. The collagen displayed greater scores with effectiveness, enhancement of daily activities, and improved quality of life during osteoarthritis and functional index testing methods. In addition to these three benefits, bone broth soup is also known to promote brain health, adrenal function, a sound sleep, and healthy skin, hair, and nail growth. It is also anti-inflammatory and can relieve pain from arthritis and rheumatoid arthritis. Another benefit is in your wallet. Making your own broth will surely save you some money. How do you prepare such a wonderfully healing bone broth? It’s actually very easy. Roast your bones in the oven for about 30 minutes at 350 degrees Fahrenheit. Next, put the bones in a large pot, and fill it with filtered water. Let it sit in the water for 20–30 minutes. Add your choice of spices and vegetables (I like to use one onion, two large carrots, and two large celery stalks). Bring broth to a boil, then reduce heat and simmer until it is complete. I enjoy bone broth soup from beef (48-hour simmer), chicken (24 hours), and wild fish (eight hours). Remember: the healthier the animal, the better the broth. Wald, A., et al., “Stimulation of gastric acid secreted by glycine and related oligopeptides in humans,” American Journal of Physiology February 1982; 242(2): G85–88. 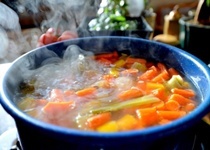 “How to Make Bone Broth,” Wellness Mama web site; http://wellnessmama.com/5888/how-to-make-bone-broth/, last accessed September 17, 2014. Rennard, B.O., et al., “Chicken soup inhibits neutrophil chemotaxis in vitro,” Chest October 2000; 118(4): 1150–1157. Crowley, D.C., et al., “Safety and efficacy of undenatured type II collagen in the treatment of osteoarthritis of the knee: a clinical trail,” International Journal of Medical Sciences October 9, 2009; 6(6): 312–321. Jade, K., “Bone Broth Benefits: From Digestion to Joint Pain,” Mother Earth News web site, August 26, 2014; http://www.motherearthnews.com/real-food/bone-broth-benefits-from-digestion-to-joint-pain-zbcz1408.aspx#axzz3DZtPT7Lg.